Many day-to-day technology tasks have become so intuitive for many of us that it’s easy to forget life before these clicks and swipes. For people with I/DD, these skills can make a world of difference by building bridges to community participation. The Arc Baltimore’s labs provided an overview of Assistive Technology and a demonstration of devices and software to address communication, computer access, eating, environmental control, hearing, home safety, memory and cognition, telephone access, recreation, and vision. Stories were shared on how individuals have utilized devices. A certified Assistive Technology Professional worked one-on-one with participants to identify and experiment with tools that would be a good fit for them. Easter Seals/The Arc of Northern Indiana hosted an instructional computer lab focusing on life skills, employment, internet safety, and money management. The session was so successful that one participant found a job he was interested during the class. The next day, he submitted an application online for that job at Game Stop and landed an interview. The Arc of PG County hosted labs covering topics related to independent living, including eating healthy, resume building, tech tools for reading, grocery shopping, job seeking/applications, money value, and understanding maps. At the conclusion of the event, local companies even pledged to employ more people with I/DD! One participant, Brianna, found a screen reader helpful—it helped her pronounce words correctly in addition to easier reading. She compared it to audible books and thinks it “unleashes the power of spoken words”. NewStar’s labs had a strong focus on iPad skills, including skills for independent living like taking pictures, iMovie, iModeling, maps, planning a trip, and setting and using reminders. Three Learning Lab participants, David, April, and Charles, requested additional labs on the Maps app, and were surprised to learn that there are bus stops extremely close to their houses that will help them gain independent access to the community. The Arc of San Francisco’s labs were centered on using technology for independence and employment. Topics covered included internet safety, Microsoft, LinkedIn, online job searching, and the basics of email. One participant, Kristin, was struggling with how to best use LinkedIn. After working on her picture, resume, endorsements and recommendations in the lab, Kristin landed interviews at both Google and LinkedIn! Topics on computer basics, including terminology, parts, safety/care, and typing, were covered. They worked in Microsoft Word, Publisher, Powerpoint, and used email and iPads. Most importantly, they learned about internet safety issues like identity theft protection, safe passwords, and digital footprints. “When asked about his favorite part of the class Jason exclaimed, “I was really excited to make my resume and get closer to my dream job”. Through this simple exposure to the basics of digital technology, participants are building the skills that will support them to become more independent within their communities. We look forward to expanding Learning Labs to more chapters and building the skills to succeed in people across the country! The catastrophic flooding that inundated the greater Baton Rouge and surrounding areas has had a devastating impact on the children, adults and families we serve, as well as our staff. We are still trying to locate some of them. Fortunately, we located all of the individuals that we directly support who were forced to evacuate from their own homes or apartments. All of them have been moved out of shelters and into shared housing with others who were not flooded. Many of those who live with their families were also forced to evacuate. Some are with other family members that were spared. Some are in area hotels. Others were able to return home once the water subsided. Unfortunately, there are areas that are still flooded. Many staff members have also suffered tremendous losses. We have yet to locate 2 individuals with I/DD and 11 Direct Support Professionals. Of those we have contacted, 60 were forced to evacuate and lost their homes to the flood. Most also lost their vehicles. Children’s Services Center, the offices and team meeting place for Early Intervention Special Instructors, OTs, PTs and Speech Therapists. Metro Enterprises – Prescott Road 1 of 2 locations where crews and enclaves meet before heading to their work site, for others to meet for community volunteer activities, and where our day habilitation services are provided. The Respite Care Center for children and adults who are in need of short term residence in a home environment, to relieve family from continual care or in an emergency including instances of abuse or neglect. These buildings are located in areas that were mapped as being “safe” from flooding. Like thousands of individuals and businesses in “safe” areas, we did not have flood insurance on these buildings. The maximum water damage coverage we do have is $25,000 per event for ALL property. Repairs and recovery of the Respite Center is a priority because it will provide temporary housing not only for those people we support who are guest in others homes, but for additional folks with I/DD who are still in shelters. We received one estimate for repairs for the Respite Center – the smallest of the three flooded facilities – of $167,000. We also lost four mini-vans, a full-size automobile used for community inclusion outings, a box truck used to haul paper for shredding contracts and other recyclable goods, and a fork lift. We are overwhelmed by the kind words and encouragement from our friends and extended family of The Arc. Cliff Doescher, the Executive Director of The Arc Greater New Orleans, contacted us almost immediately, offering staff volunteers to help with cleanup and repair efforts. A group of ten will be heading here this Friday and a second group of twelve will be in Baton Rouge next Tuesday. In a traumatic event of this scale, it is important to reestablish “normal” routines as quickly as possible – for the sake of the children, the adults and their families. As soon as the waters receded, EarlySteps staff resumed seeing children in their homes or other natural settings. Metro staff worked quickly to re-arrange the space at Dallas Drive to make room and accommodate employees and day services clients from the Prescott Road facility. Teamwork and flexibility have minimized our down-time and expedited resumption of services when and wherever possible. TIM lived with supports in the same home where he grew up. His sister had remodeled it for him recently, updated with bright new furnishings and total accessibility for his wheelchair. By Friday evening streets in Tim’s neighborhood were flooded, and he and Christy, his day worker, could not get out. With the help of the National Guard they were evacuated by boat to a nearby church shelter on Saturday. As the water continued to rise, they were moved to a high school shelter, where they didn’t stay dry for very long. Christy had to push the wheelchair through the water up to a t-building which was on higher ground. She stood in the water for several hours while holding Tim’s wheelchair on the ramp above the water. When the next boat came they were brought to safety at Central Middle School, where they would finally be dry for the night. The middle school was a nice facility. There were 2 gyms which allowed shelter volunteers to better accommodate elderly folks and those with disabilities in separate areas; however, all the shelter’s cots were already occupied by other evacuees. Tim got very little sleep sitting upright in his wheelchair. Sunday morning he was moved to a cot, and it goes without saying, he fell fast asleep. In such a chaotic situation, tracking people down between shelters was no easy task; many people were without cell phone service, and land lines and other utilities were failing by the minute. On top of that… Sunday morning brought the workers’ 4th shift change that had NOT happened. Tim’s Friday daytime DSW was still by his side, caring for him, and unable to get back to be with her own family. They had been completely surrounded by floodwaters with no way in or out. Amy, Supported Living Program Director, had not given up on finding the two and finally tracked them down at Central Middle School. By this time the water had receded and vehicles were able to drive closer to the school. Amy contacted Barry, Executive Director, to go with her to pick them up. They decided to take Barry’s Jeep because it was several inches higher from the ground than Amy’s van. Words could not describe the excitement on their faces when Tim and Christy spotted Amy and Barry walking into the gym. But after spending time together and becoming new friends, the shelter volunteers hated to see them go. So what, right? They grabbed the garbage bag with Tim’s personal items, thanked the volunteers, said their good-byes and headed for the door. Unfortunately The Arc’s Respite Care Center had been flooded, so THE go-to shelter in an emergency or crisis situation was not an option. Right away Amy thought of Lynette, who lives in her own place with full supports. Some might say Lynette is non-verbal, but there was no doubt of her welcoming reply when asked if she would be willing to share her home with Tim, indefinitely! She even volunteered her own bed, equipped with side rail and certain to be the most important amenity to Tim. Even in the comfort of his own home, he rarely slept all night. Sunday. . . Tim slept all night. BETH AND DONNA each lived on their own in the same apartment complex. They were already friends and occasionally went on outings together. On Saturday when the waters rose from the streets and then into the parking areas of the complex, it seeped into Donna’s home first. No worries… her DSW checked in with Beth’s worker who agreed they should head there. It didn’t take long for the water to rise into Beth’s apartment. They called every single emergency number they could find, and learned that first responders and volunteers were already evacuating the complex, building by building. Beth’s apartment was close to the end of the property, and they waited outside, all night, for their turn to be rescued. Sunday morning brought with it a rescue boat. Unfortunately one could not choose where they wished to be dropped off. Unloading areas were at random places of highest ground, along a street or other high pavement. Now safe on dry land, the ladies were stranded. 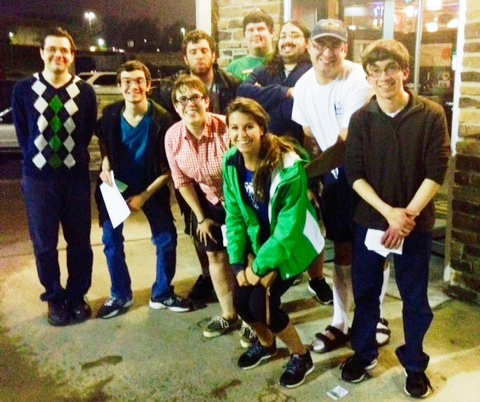 Arc BR Supervisor, Natalie, was relieved to get their call for help. In the past she had worked in a neighborhood near Beth and Donna’s apartment complex, and knew her way around the back roads. She found a route that was not under water, and was able to drive right up to where they stood at the side of the road. She drove them to Mary’s house – another friend in supported Living – who had not been flooded. Fortunately Mary has a 3rd bedroom in her Habitat for Humanity home that she shares with a housemate. She welcomed Beth and Donna as temporary guests; they share a bedroom, and when possible, the 4 of them share workers. DURING NORMAL TIMES there are more than enough hotel rooms in and around Baton Rouge to accommodate tourists, business travelers, sports enthusiasts and concert-goers. Several employees of The Arc’s Metro Enterprises Employment Program realized the magnitude of flooding and number of people displaced when they began their search for hotel rooms. Saturday night Byron’s mother finally found a vacant room for 2 nights in Eunice, LA; a small town almost 80 miles away. For 2 days they drove from there into Baton Rouge to begin the cleanup phase of their flood-damaged home, and then back again at night. Their search for another vacant room took them 110 miles away from home to Alexandria, which is considered central Louisiana. Hopefully Byron and his family have found a place to stay that’s closer to home. And much like tens of thousands of other folks, they continue to work together – gutting and cleaning what’s left of their homes – and determined to rebuild and recover. Innovations in programming at The Arc of the St. Johns in St. Augustine, Florida, are most often driven by specific needs and interests identified by the individuals they serve. That, of course, calls for listening, understanding, and the flexibility to step outside the norm. The individuals there enjoy an active learning curriculum, with rotating classes in computer proficiency, culinary and health, structured physical education, arts and crafts, and Adult Basic Education in cooperation with the community college in St. Augustine. Children with special needs have the Therapeutic Learning Center, and young adult age 18 to 22 attend the St. Johns Community Campus, both charter schools. Andy, a client of the chapter, has always been a curious and adventurous soul. The twenty-six year-old sees every class as a fresh and productive opportunity to experience and achieve very measurable objectives, most for the very first time. These therapeutic exercises are helping to train his hands and arms to stir a pot full of beans in Culinary Class, and to operate his own Facebook page in computer class, aided by an ocular directed mouse. St. Augustine is an active coastal community in Northeast Florida, and The Arc of the St. Johns has seen a void as many men, women and children with intellectual and developmental disabilities (I/DD) were missing the opportunity to enjoy the ocean and connect to a caring and sharing community of avid surfers. 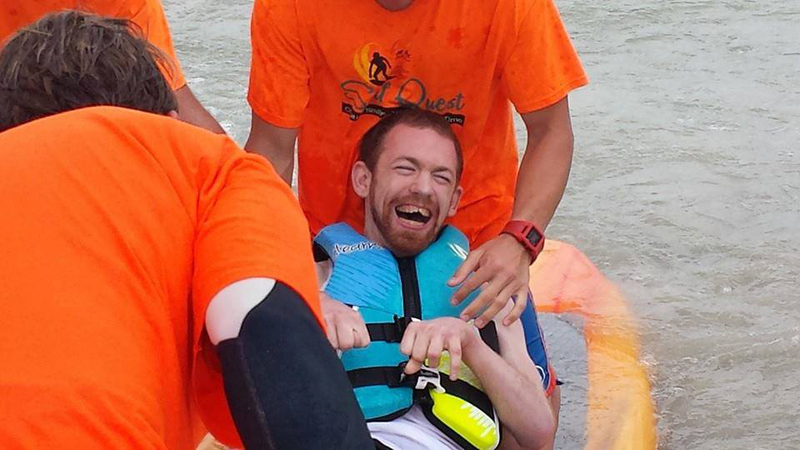 In response to the obvious need, and the urgings of Andy and his friends, The Arc created Surf Quest, a free monthly event with trained and enthusiastic volunteers who introduce adaptive aquatic recreation using specialized surfboards and flotation devices for anyone with a disability. The Surf Quest season opened in March 2015 and will culminate with the Black Ties and Board Shorts Awards Banquet in September. Andy truly captured the hearts and attention of the entire crew of trained and experienced volunteer coaches, virtually all of whom had little or no experience or interaction with individuals with I/DD. 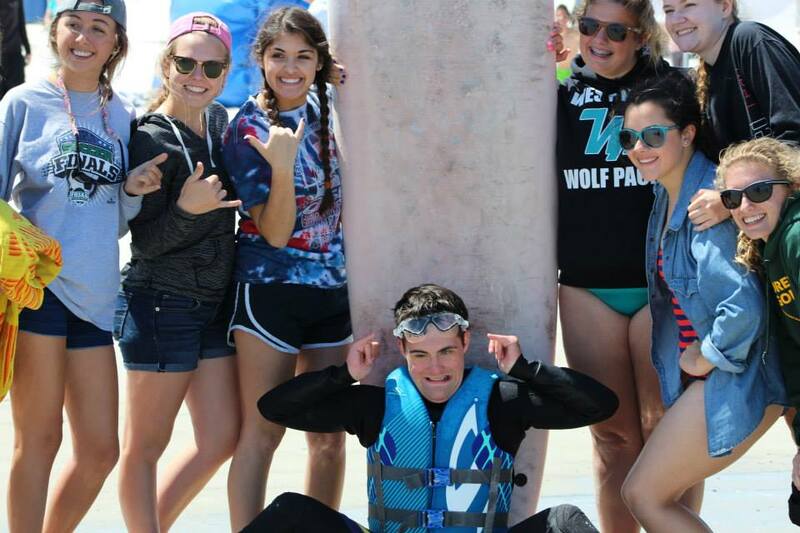 “Andy’s Crew” found the way to get Andy into the surf and on to a surfboard for a half-dozen rides. Jordan is his ride-along, and said, “Andy’s courage and effusive enthusiasm touched all of us, and we feel the same way about every one of these guys. We’ll be here for every event. As for Andy, he has gone back to the computer to edit his video, adding a Beach Boys soundtrack. He has also created his shopping list for new wardrobe essentials for the next Surf Quest event: Some cool Ray Ban sunglasses, a pair of wild flower-print board shorts with a matching tank top, and a big, big, fluffy towel. Find Andy’s action video on Facebook: Surf Quest – The Arc of the St. Johns. And, visit The Arc of the St. Johns website – www.arcsj.org. Primary contact is Lynne Funcheon – lfuncheon@arcsj.org. 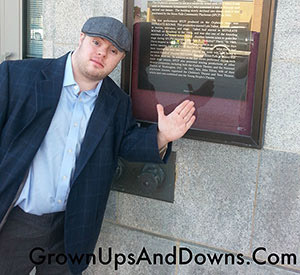 An interview with Sara Wolff, board member of National Down Syndrome Society, Board Member of The Arc of Pennsylvania, and her local chapter, The Arc Northeastern Pennsylvania as their Secretary. Sara Wolff, 31, is a leading advocate for the Achieving a Better Life Experience (ABLE) Act for 8 years and continuing speaking and advocating for people with intellectual and developmental disabilities (I/DD), Down syndrome and other disabilities. Sara spoke to The Arc’s staff by phone on her way back home to Pennsylvania after attending the President’s State of the Union address as a guest of her U.S. Senator, Bob Casey. Members of Congress are given only one ticket for a guest at the annual speech before Congress. 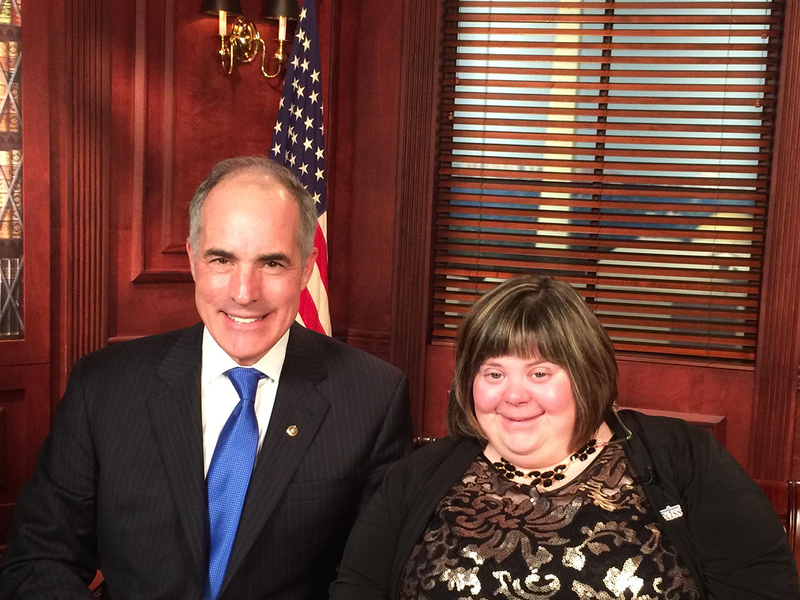 Sara and Senator Casey worked together on the ABLE Act, which President Obama signed into law in December of 2014. What did you do before attending the speech? I had dinner with Senator Casey and his wife, we had a great time. We also did some television interviews – it was awesome. We did four interviews together and we talked about the ABLE Act and many other issues. What did you think about the speech? I was very interested in many of President Obama’s points – I liked what he said about education and the middle class. What did you think about being in the chamber? Unreal. I felt like I was right there, with the President. Where I was seated he was right in the center. What an experience that I will never forget. It was crowded and I sat with a lot of people. I met a lot of people and I had a good time. I did have a good view of the President speaking. What did you do after the speech? I just hung out with my sister and Senator Casey’s staff. Went back to his office for a little while. It was a really cool night. I’m looking forward to getting home and doing more with the National Down Syndrome Society, The Arc of Northeastern Pennsylvania, and continuing to working at O’Malley & Langan Law Office in Scranton.